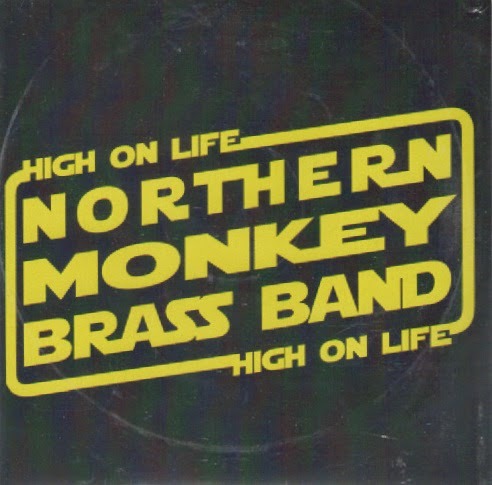 High on Life is the recording debut of the majestic Northern Monkey Brass Band. Trumpeter Graham Hardy has assembled some of the finest brass players and percussionists to play a music that never fails to move body and soul. The best of American street bands – from the Dirty Dozen Brass Band to the Youngblood Brass Band – the inspiration, Hardy has taken a people’s music of the early twentieth century and given it a twenty first century twist. High on Life comprises six tracks. Hardy wrote four of them and arranged two others. Funky Pie - Part 2 opens the CD with a bang. Theme stated, all-action ‘bone man David Gray leads the attack, the band’s sole reeds man Jamie Toms interjects, Gray re-asserts his authority, a determined Toms comes back for more, Hardy makes a startling entrance, all marshalled by Phil Rosier’s funkin’ tuba. Rosier starts the ball rolling on the title track High on Life, Toms is quick on the uptake, Nik Alevroyiannis snaps the snare and Toms’ rollercoaster tenor is only brought to a halt by insistent snare work. Toms cannot resist a final flourish… is that a quote from kids’ favourite The Magic Roundabout? Heroic monkeys in orbit are the stuff of space legend. On John Williams’ Imperial Cantina the Northern Monkeys embark upon an Interstellar Space journey. ‘I haven’t seen Star Wars’ you say. Don’t worry, sit back and enjoy the trip! The familiar refrain lifts off in a retro dance band space capsule powered by expert ensemble work. Fun, fun, fun. Hardy plays fearlessly on his own composition The Melon Felony. Rosier rolls out the bass line, percussionists Alevroyiannis and Brendan Murphy keep it firmly in the pocket as Hardy and Alastair Lord fire a two-trumpet volley skywards. Hardy’s solo is good reason to acquire the CD (play the track on repeat). Kitsch hip populist material never did anyone any harm, so a Northern Monkey take on Beyoncé’s hit Single Ladies works a treat. It’s what you do with it that counts; a playground squabble, massive tuba, lyrical tenor. The final track – Horndoggin’ – is a Horn Dogs’ pup adopted by the Northern Monkeys. The rhythm section sets the tempo, horns play with the melody, tenor and trumpet trade, take it home boys! The CD is available at www.northernmonkeybrassband.com and from the band at gigs. Play it loud! The band’s CD launch gig is at Hoochie Coochie, Newcastle on Sunday 6 July (5:00 pm). A lunchtime date at Brass: Durham International Festival (Friday 18 July) is in the diary, as is St Cuthbert’s Centre, Crook on Friday 1 August (7:30 pm). High on Life is dedicated to the memory of John Wheeler.